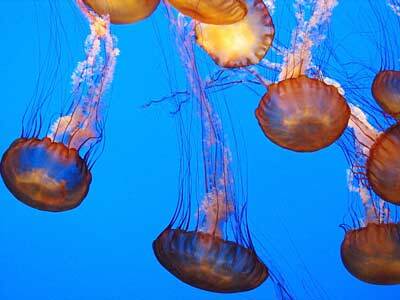 The Monterey Bay Aquarium is one of my favorite places along the California Coast. It's amazing how much thought has been put into making this one of the great museums of the world. The sheer amount of content within its walls is staggering. You could easily spend a day just reading all the panels and signs - but then you'd be missing the exhibits! Both Kazumi's and my most favorite area is the Jelly Fish section of the aquarium. The Jellies are gorgeous and the presentation is breathtaking: Large, deep blue tanks in which the Jellies are forever floating down against the movement of the water. Taken with our Canon S2IS at a rather high ISO setting. Click for a larger version.